For my birthday yesterday, I chose to have dinner at Ad Hoc, Thomas Keller's casual, family-style restaurant in Napa. It was easily (and not surprisingly) the best meal I've had in recent memory. I'd heard and read great things about Chef Keller for years, but now that I've had a transcendent meal at one of his restaurants, I'm an official groupie. I came straight home and bought a copy of Ad Hoc at Home, which is a stunning work of art posing as a cookbook. This cake was the first thing that jumped out at me. I feel strongly that grapefruit is a severely underrated citrus fruit, and will take any excuse to bake with them. The method was nearly identical to the Lemon Lemon (Lemon) Loaf that I made last year. The cake is incredibly moist, appropriate for breakfast or dessert, and perfect with a cup of tea or coffee. There was a time in the not-so-distant past when I felt that Thomas Keller's recipes for home cooks were infinitely beyond my ability and skill level. Thank you, Chef Keller, for inspiring the beginning of a new era in my kitchen; in my opinion the best thing that could happen on my birthday. Also? Thank you for serving a cheese course from the Von Trapp family's Vermont farm at my birthday dinner. That pretty much made my life. 1. Preheat oven to 350 degrees. Spray a 10x4 or 9x5 inch pan or lightly oil it (Amy's note: I have 2 9x3 pans so I split the batter between the 2 and adjusted the baking time). 2. Sift flour and baking powder. Stir in salt and set aside. 3. Combine the sugar and eggs in a mixer and beat at medium speed for 3 minutes until the mixture is thickened. Beat in the milk, then the oil, grapefruit zest and vanilla. Reduce the speed to low and add the flour mixture, mixing just to incorporate. 4. Spread batter in the pan. Put the pan on a small baking sheet and bake for 30 minutes. Turn the pan around and bake for another 30 minutes. Transfer the pan to a cooling rack. 5. While cake is baking, combine the grapefruit juice and sugar in a small saucepan, bring to a simmer, stirring to dissolve sugar. Simmer one minute. Set aside. 6. When you remove the cake from the oven, using a long skewer, poke deep holes every ¾ inch or so all over the top. Immediately begin brushing the syrup over the cake. It may be necessary to wait for the syrup to soak in, but continue until you’ve used all the syrup. Let the cake cool for about 10 min. 7. Turn out the cake onto a cooling rack. Turn it right side up, and let cool to room temperature. 8. Stir the powdered sugar and grapefruit juice together in a bowl until smooth. Using a spoon, drizzle the icing on a diagonal over the top of the cake, allowing it to drip down the sides. Garnish with grapefruit slices (optional). Slice and serve. I've definitely had my eye on this recipe for a while... it looks gorgeous! And I like the idea of using grapefruit in a cake too. I'm so envious of your meal at Ad Hoc. I hope to eat there or at The French Laundry when I get out that way. I met Thomas Keller at a book signing a few months ago, and I couldn't believe how nice and down to earth he is. He's such an incredible person. Have been cooking my way through Ad Hoc slowly but really can't wait to eat at his restaurants! I've been to the Von Trapp home in Vermont. But I have not eaten at Ad Hoc. Lucky birthday girl! Yum. I'd love to try one of Keller's restaurants. Sounds delicious! 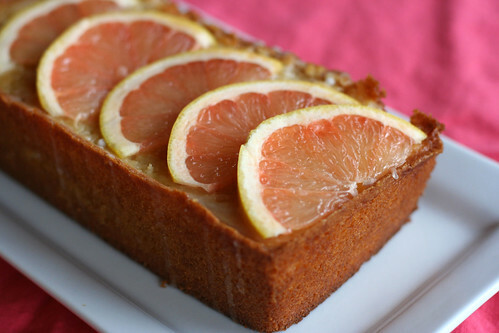 I have never heard of a grapefruit cake and I love it! Sounds amazing. Amy! I am NOT a grapefruit fan, but the photo and your recommendation (and the fact that large amounts of sugar are used) has prompted me to try this recipe too. Happy belated b-day! all this cake is missing is a cute little tea party to go with it. where and when is the tea party?! i'm there!! Birthday Cake Delivery Thank you for sharing ..!! i like it ! !